Pilate, reassured by a centurion that the death had taken place, allowed Joseph’s request. Joseph immediately purchased fine linen (Mark 15:46) and proceeded to Golgotha to take the body of Jesus down from the cross. There, assisted by Nicodemus, Joseph took the body and wrapped it in the fine linen and applied myrrh and aloes Nicodemus had brought, according to John 19:39. Jesus’ body then was conveyed to the place that had been prepared for Joseph’s own body, a man-made cave hewn from rock in the garden of his house nearby. This was done speedily, “for the Sabbath was drawing on”. This event is also mentioned in Luke 23:50–56. 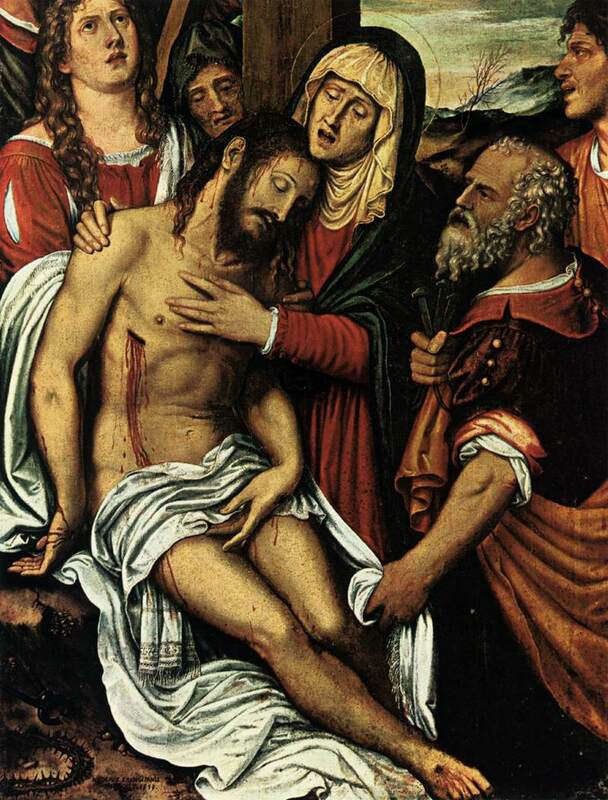 Joseph of Arimathea is venerated as a saint by the Roman Catholic, Eastern Orthodox, Lutheran, and some Anglican churches. His feast day is March 17 in the traditional Roman Catholic liturgical calendar. Eastern Orthodox churches commemorate him Sunday of Pascha (i.e., the second Sunday after Easter) and on July 31, the date shared by Lutheran churches. He appears in some early New Testament apocrypha, and a series of legends grew around him during the Middle Ages, which tied him to Britain and the Holy Grail. Since the 2nd century, a mass of legendary detail has accumulated around the figure of Joseph of Arimathea in addition to the New Testament references. Joseph is referenced in apocryphal and non-canonical accounts such as the Acts of Pilate, a text often appended to the medieval Gospel of Nicodemus and The Narrative of Joseph, and mentioned in the works of early church historians such as Irenaeus (125–189), Hippolytus (170–236), Tertullian (155–222) and Eusebius (260–340), who added details not found in the canonical accounts. Hilary of Poitiers (300–367) enriched the legend, and Saint John Chrysostom (347–407), the Patriarch of Constantinople, was the first to write that Joseph was one of the Seventy Apostles appointed in Luke 10. During the late 12th century, Joseph became connected with the Arthurian cycle, appearing in them as the first keeper of the Holy Grail. This idea first appears in Robert de Boron’s Joseph d’Arimathie, in which Joseph receives the Grail from an apparition of Jesus and sends it with his followers to Britain. This theme is elaborated upon in Boron’s sequels and in subsequent Arthurian works written by others. 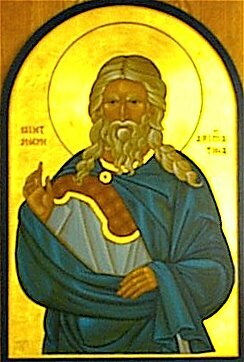 Later retellings of the story contend that Joseph of Arimathea himself traveled to Britain and became the first Christian bishop there. And likewise Joseph also stepped out and said to them: Why are you angry against me because I begged the body of Jesus? Behold, I have put him in my new tomb, wrapping in clean linen; and I have rolled a stone to the door of the tomb. And you have acted not well against the just man, because you have not repented of crucifying him, but also have pierced him with a spear. The Son of God whom you hanged upon the cross, is able to deliver me out of your hands. All your wickedness will return upon you. When the elders returned to the cell, the seal was still in place, but Joseph was gone. The elders later discovered that Joseph had returned to Arimathea. Having a change in heart, the elders desired to have a more civil conversation with Joseph about his actions and sent a letter of apology to him by means of seven of his friends. Joseph traveled back from Arimathea to Jerusalem to meet with the elders, where they questioned him about his escape. 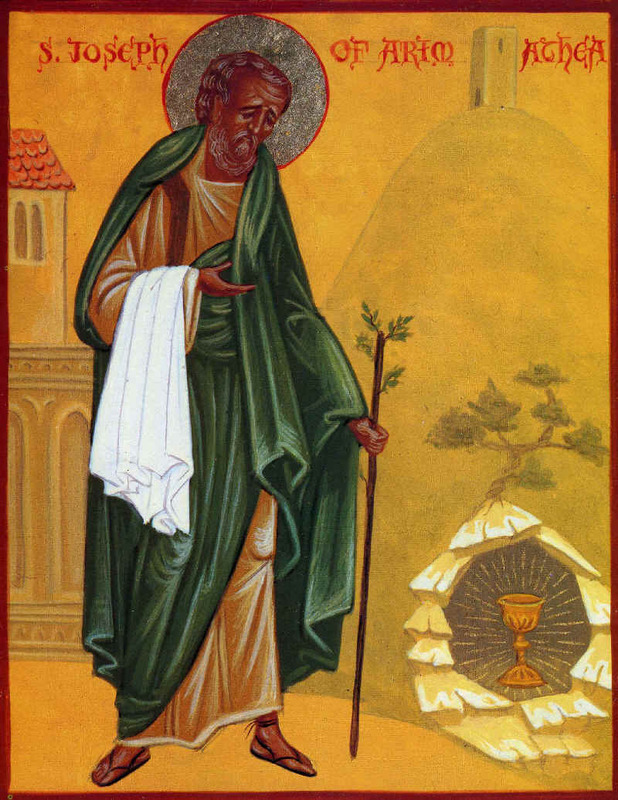 According to The Gospel of Nicodemus, Joseph testified to the Jewish elders, and specifically to chief priests Caiaphas and Annas that Jesus had risen from the dead and ascended to heaven and he indicated that others were raised from the dead at the resurrection of Christ (repeating Matt 27:52–53). He specifically identified the two sons of the high-priest Simeon (again in Luke 2:25–35). The elders Annas, Caiaphas, Nicodemus, and Joseph himself, along with Gamaliel under whom Paul of Tarsus studied, traveled to Arimathea to interview Simeon’s sons Charinus and Lenthius. … all the limits of the Spains, and the diverse nations of the Gauls, and the haunts of the Britons–inaccessible to the Romans, but subjugated to Christ. Tertullian does not say how the Gospel came to Britain before AD 222. However, Eusebius of Caesarea, (AD 260–340), one of the earliest and most comprehensive of church historians, wrote of Christ’s disciples in Demonstratio Evangelica, saying that “some have crossed the Ocean and reached the Isles of Britain.” Saint Hilary of Poitiers (AD 300–376) also wrote that the Apostles had built churches and that the Gospel had passed into Britain. Hippolytus (AD 170–236), considered to have been one of the most learned Christian historians, puts names to the seventy disciples whom Jesus sent forth in Luke 10, includes Aristobulus of Romans 16:10 with Joseph, and states that he ended up becoming a pastor in Britain. In none of these earliest references to Christianity’s arrival in Britain is Joseph of Arimathea mentioned. Leaving the shores of Asia and favored by an east wind, they went round about, down the Tyrrhenian Sea, between Europe and Africa, leaving the city of Rome and all the land to the right. Then happily turning their course to the right, they came near to the city of Marseilles, in the Viennoise province of the Gauls, where the river Rhône is received by the sea. There, having called upon God, the great King of all the world, they parted; each company going to the province where the Holy Spirit directed them; presently preaching everywhere. 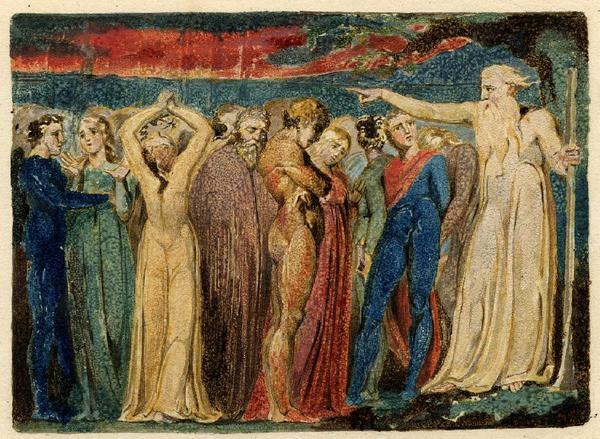 In 1989 A. W. Smith critically examined the accretion of legends around Joseph of Arimathea, by which the poem hymn of William Blake, Jerusalem, ( “And did those feet in ancient time”) is commonly held as “an almost secret yet passionately held article of faith among certain otherwise quite orthodox Christians” and Smith concluded “that there was little reason to believe that an oral tradition concerning a visit made by Jesus to Britain existed before the early part of the twentieth century.” Folklorist Rev. 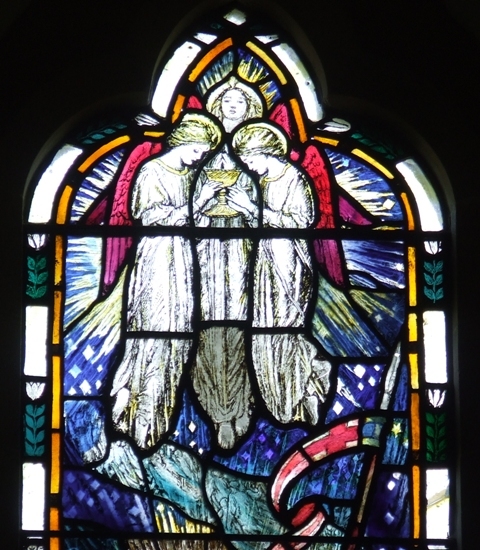 Sabine Baring-Gould recounted a Cornish story concerning how “Joseph of Arimathea came in a boat to Cornwall, and brought the child Jesus with him, and the latter taught him how to extract the tin and purge it of its wolfram. This story possibly grew out of the fact that the Jews under the Angevin kings farmed the tin of Cornwall.” In its most developed version, Joseph, a tin merchant, visited Cornwall, accompanied by his nephew, the boy Jesus. C.C. Dobson (1879–1960) made a case for the authenticity of the Glastonbury legend. The case was argued more recently by Dr Gordon Strachan (1934–2010) and by Dennis Price. The legend that Joseph was given the responsibility of keeping the Holy Grail was the product of Robert de Boron, who essentially expanded upon stories from Acts of Pilate. In Boron’s Joseph d’Arimathe, Joseph is imprisoned much as in the Acts, but it is the Grail that sustains him during his captivity. Upon his release he founds his company of followers, who take the Grail to Britain. The origin of the association between Joseph and Britain is not entirely clear, but it is probably through this association that Boron attached him to the Grail. In the Lancelot-Grail Cycle, a vast Arthurian composition that took much from Boron, it is not Joseph but his son Josephus who is considered the primary holy man of Britain. Helaius, Nepos Joseph, Genuit Josus, Josue Genuit Aminadab, Aminadab Genuit Filium, qui Genuit Ygernam, de qua Rex Pen-Dragon, Genuit Nobilem et Famosum Regum Arthurum . . .
Elizabeth I cited Joseph’s missionary work in England when she told Roman Catholic bishops that the Church of England pre-dated the Roman Church in England. Another famous story claims that when Joseph set his walking staff on the ground while he slept, it miraculously took root, leafed out, and blossomed as the “Glastonbury Thorn.” The constant retelling of such miracles encouraged the pilgrimage trade at Glastonbury until the Abbey was dissolved in 1539, during the English Reformation. The Glastonbury Thorn is a form of Common Hawthorn, Crataegus monogyna ‘Biflora’ (sometimes incorrectly called Crataegus oxyacantha var. praecox), found in and around Glastonbury, in Somerset. 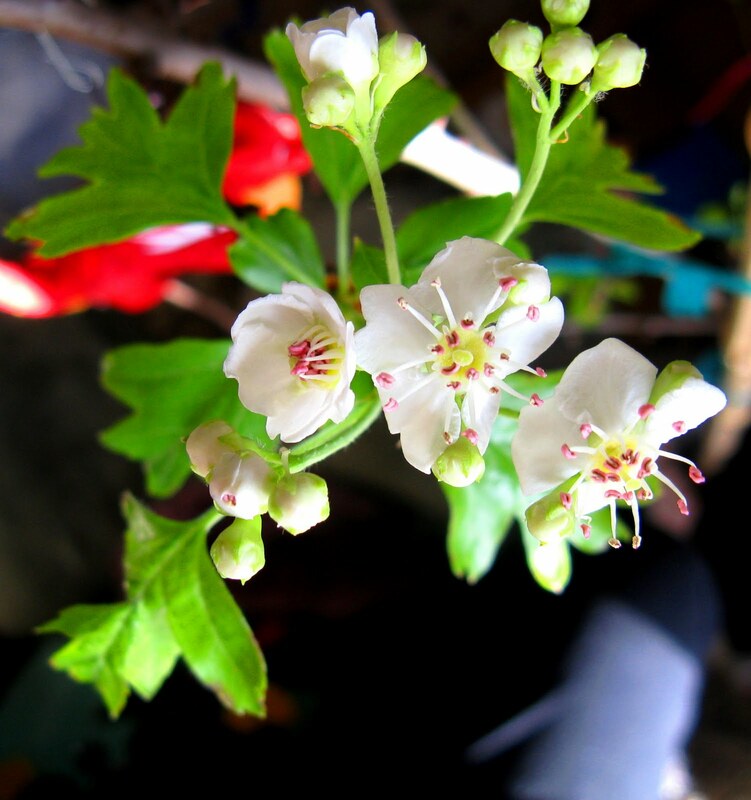 Unlike ordinary hawthorn trees, it flowers twice a year (hence the name “biflora”), the first time in winter and the second time in spring. The trees in the Glastonbury area have been propagated by grafting since ancient times. It is associated with legends about Joseph of Arimathea and the arrival of Christianity in Britain, and has appeared in written texts since the medieval period. A flowering sprig is sent to the British Monarch every Christmas. The original tree has been propagated several times, with one tree growing at Glastonbury Abbey and another in the churchyard of the Church of St John. 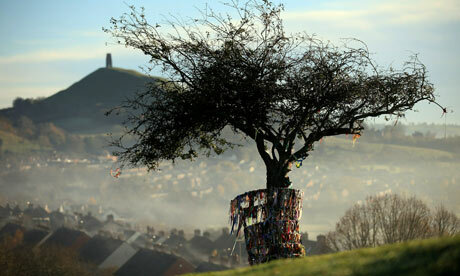 The “original” Glastonbury Thorn was cut down and burned as a relic of superstition during the English Civil War, and one planted on Wearyall Hill in 1951 to replace it had its branches cut off in 2010. Somerset, where Glastonbury is located, is noted for a number of famous ingredients including Cheddar cheese and traditional cider (as well as perry which is like cider but made from pears). Although Cheddar cheese originated in Cheddar in Somerset it has no Protected Designation of Origin (PDO) within the European Union. However, only cheddar produced from local milk within four counties of South West England, may use the name “West Country Farmhouse Cheddar.” Well worth sampling; you won’t want a pallid, tasteless, yellow block of soap after that. 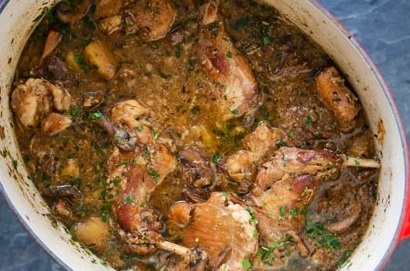 Here is a classic casserole of rabbit baked in cider. Make sure you are using a good English cider (not sparkling). I recommend serving diced potatoes and carrots as side dishes, but you can also just cook them in the casserole with the rabbit. Melt half the butter in a frying pan. Sauté the rabbit pieces until lightly browned. Remove them with a slotted spoon and place in a casserole. Add the onion and mushrooms to the frying pan and sauté for 4 or 5 minutes until light golden. Remove with a slotted spoon and add to the casserole. Melt the remaining butter in the frying pan, add the flour and cook for a minute or two stirring constantly to make a blond roux. Remove from the heat and gradually stir in the dry cider with a whisk so as not to form lumps. Return to the heat and bring to the boil, stir constantly. Cook for a minute. Season with salt and pepper to taste. Pour the sauce over the rabbit. Cover the dish and cook at 375°F/190°C for about an hour or until the rabbit is tender. Do not overcook. Rabbit can easily dry out if cooked too long. Just before serving stir in the cream. Serve with poached new potatoes and diced carrots.